Ali Funeka must wonder why he ever left South Africa to box in North America. In his last three appearances, Funeka has gone 0-2-1, having some form of controversy in each fight. Nate Campbell came into their encounter overweight by a couple of pounds. Funeka was robbed of a decision in Quebec against Joan Guzman. Then, in the rematch, Guzman weighed in a ridiculous NINE pounds over the lightweight limit and won a close decision. It is absurd to think that he was allowed to weigh that much over the limit and fight. 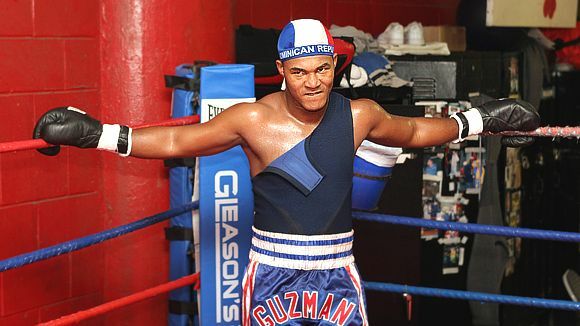 If the 6-foot-1 Funeka can make the 135-pound limit, Guzman (only 122 pounds five years ago) should be able, too. Promoter Gary Shaw said Funeka wouldn’t fight him after hearing that Guzman was that heavy, but went through with the fight, anyway. Shaw’s fighter lost. That, however, is not what bugs me the most. Nate Campbell may have come in overweight, but he has a pretty solid record of making weight to indicate that this was a one-time incident. Also, he weighed in only a couple pounds over. Guzman has a history of weight problems, including, ironically, a scrapped fight with Campbell. He served a minor suspension for that one, then did it again. From the look on his face at Friday's weigh-in, it didn't seem that he even cared. It is beyond disrespectful to the fans, promoters, his opponent, and everyone involved to come in that much overweight. I wonder how Guzman has been able to secure any notable fights. He fights usually about once a year, comes in massively overweight and has no respect for the sport. Is there actually anyone out there who is a fan of Guzman and believes he deserves fights? If so please e-mail me via the contact info at the bottom of the page and explain your rationale. Guzman says he wants Marcos Maidana at 140 -- but he couldn’t even get down to 140 so I don’t see how he’s going to make that fight happen. The fact is, he does not deserve any notable fights at all. Here we have a guy who comes in NINE pounds overweight, which is nearly two divisions over, but he’s allowed to fight and walks away with his perfect record intact. Meanwhile, the guy who travels all the way from South Africa does everything right, gets a loss and who knows when he’ll get a another decent fight? Guzman is simply a disgrace to the sport and I can’t see how anyone could disagree. Last week I offered a few predictions of this past weekend’s fights. Time to review my forecasts, rate the winners and discuss what the future holds for the fighters involved in the jam-packed weekend. Steve Molitor recaptured the IBF junior featherweight title with a comfortable unanimous decision, however this didn’t tell me anything new about Molitor. Ndlovu fought better than in their first matchup, but Molitor lacked a certain confidence that he once had. Yes, he has his title back, but it seems only a matter of time before he’s dealt with another setback. I hate to be so negative on my fellow Ontario native, and I hope he proves me wrong. However he has to do a lot to impress in this talent-deep division. I thought Gamboa would wipe the floor with Barros. Boy, was I wrong, but I guess if the best can be wrong, I can be too. Barros impressed me by simply sticking around for the full 12 rounds and making a fight out of it. Gamboa impressed me, since he is improving with each fight. In his fight against Mtagwa he counterpunched. Here, he had to play the role of the boxer and take it round by round. I doubt he’ll be put in with Lopez just yet because both fighters could raise their profiles for a bigger event down the line. Didn’t catch this one ,but from what I read in many reports, it was an all-out action fight with both fighters trading bombs. If Morales has any chance of making any progress in his comeback, he’ll have to get down to 140. There’s no way he can deal with the Mosleys and Mayweathers of the division. Could you imagine him taking on someone like Paul Williams? Still looks like he should head back into retirement, but staying at welterweight will result in a bad ending to a fantastic career. Guzman was nine pounds heavier at the weigh in. Worst thing was, he didn’t look like he even cared. More on this in the previous article. I was wrong to pick Cayo by decision, but he did show that he has some decent boxing skills. Maidana impressed me because he cut off the ring and did more than just whale away on his opponent. Also, he KO’d Cayo with a gut wrenching body blow. Maidana may get beat by many in the division, but he’s a threat to everyone in the division as well. Whether you think Dirrell was faking the convulsions or not, the fact is he put on a clinic and silenced many of his critics. He boxed beautifully, adding body punches to the mix, while all Abraham could do was complain about belt-line shots. Dirrell also knocked down Abraham for the first time in his career, although Arthur was off balance. Abraham was getting closer to Dirrell in the later rounds, but to say he was definitely going to win by knockout, like some believe, is absurd. He didn’t have long to do it and Dirrell wasn’t as tired as Taylor was in his outing with Arthur. Abraham has no one to blame but himself for the DQ. Dirrell was clearly down and calling him "a good actor" makes George Clooney look like a Hollywood wannabe. Whether that was the case or not, the fact is Abraham hit him while he was down, and an uppercut like that, with that angle, is good enough for a DQ in my book. Despite the win, Dirrell may still be eliminated fromm the Super Six if he loses to Ward in the final stage of this round. Abraham still has three points and can beat Froch for a guaranteed spot in the next stage.